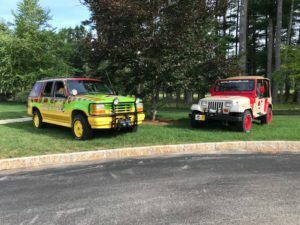 Come see the Jurassic Park vehicles provided by the Jurassic Park Motor Pool-New England Division! These privately owned vehicles were converted to look like the ones seen in the 1993 blockbuster movie Jurassic Park and were also featured in Jurassic World and Jurassic World: Fallen Kingdom. Stop by the parking lot and get your picture taken with these “dino-mite” vehicles! !